Student choreographers and two faculty members present their latest work—including a recent regional prize-winner—in the HSU spring dance concert, “Soma Spiritu,” opening Thursday, April 7 for two weekends in the Van Duzer Theatre. Ginger Greenlee, Lisa Drew, Moira Winchell Nathalie Mostrel, Kassie Guimapang, Bekah Staub in “Idiosyncrasy” by Emily Mensing. To express relationships of the body (“soma”) and spirit (“spiritu”), the HSU choreographers employ a variety of styles and thematic starting points, within the idioms of contemporary dance. How do social problems affect us, physically and spiritually? 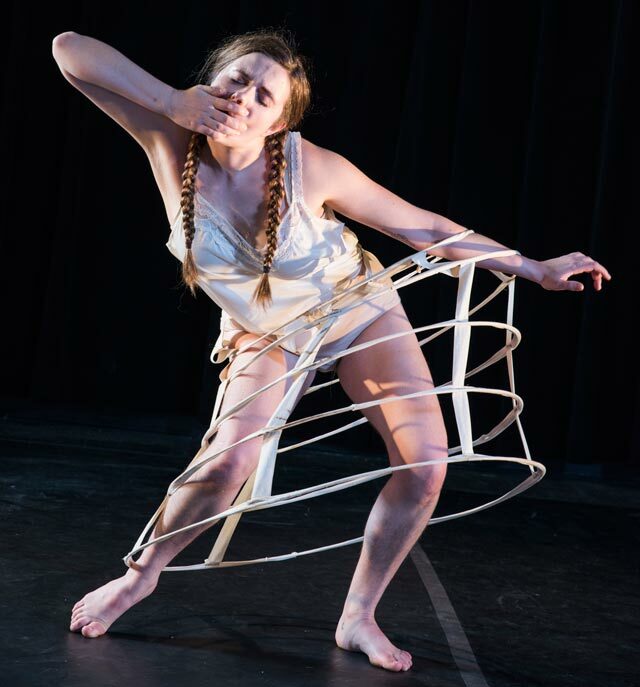 Claire Patterson takes a dramatic approach in her solo dance about the oppression of women in the arts. It was judged to be among the top ten dances presented at the recent American College Dance Association Western Conference in Scottsdale, Arizona. Emily Mensing uses comedy to puncture pomposity in her dance, “Idiosyncrasy.” Lisa Drew examines the contemporary obsession with time. Moira Winchell, Kassie Guimapang and English exchange student Megan Newbold explore conflicts within an individual. Jonny Wisan presents a spiritual narrative from the Virgin Mary’s point of view. Dancers will be selling raffle tickets, and a silent auction will be held on the second Saturday of the run (April 16) to help support the dance program and especially to cover expenses of participating in the regional dance conference. “The spring dance concert and the American College Dance festival are the two most important things that this program does,” Butcher said. “Soma Spiritu” is presented Thursdays through Saturdays April 7-9, 14-16 at 7:30 p.m., with a 2 p.m. matinee on Sunday April 17, in the Van Duzer Theatre on the HSU campus. Tickets are $10 general/$8 students and seniors, with a limited number of free tickets for HSU students at each performance, from the HSU Ticket Office (826-3928) or at the door. More information: HSUStage.blogspot.com. Produced by HSU Department of Theatre, Film & Dance.